President Trump said he was "disappointed" in Fed Chairman Powell but did not intend to fire him. After its third-biggest one-day drop in history, the Dow Jones opened lower on Thursday and seesawed all morning, underscoring a volatile market that led to heavy losses by global exchanges overnight. President Donald Trump pointed the finger at the Federal Reserve, telling reporters Thursday that he was "disappointed" in Fed Chairman Jerome Powell but did not intend to fire him. Although there is no historical precedent for such action, according to Section 10 of the Federal Reserve Act it is technically possible, since "each member shall hold office for a term of fourteen years from the expiration of the term of his predecessor, unless sooner removed for cause by the President." The Dow Jones fell by just over 100 points at the opening bell, paring earlier losses in premarket trading that saw the index down by over 300 points. Earlier, Britain's FTSE index dropped nearly 2 percent, sending it into correction territory, having lost almost 10 percent of its value since May. Asia's Nikkei index was down 4 percent, and Europe's Stoxx 600 hit its lowest level in more than 18 months. 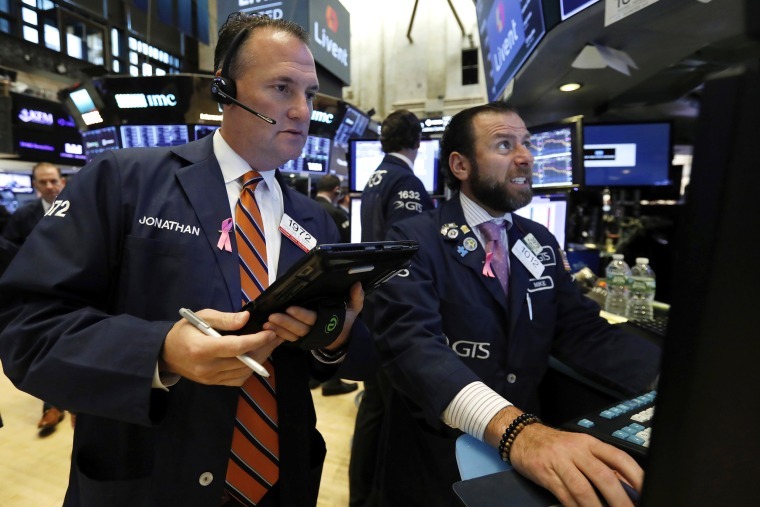 The global sell-off was triggered by Wednesday's stock market routing, when the Dow Jones plunged by more than 800 points as investors fled to safer assets over fears that rising interest rates would lead to tighter borrowing and higher inflation. With a robust economy and the lowest unemployment in nearly 50 years, the Fed has moved away from what it terms "accommodative" monetary policy, when it held interest rates artificially lower in order to help America rebuild after the Great Recession, and has raised rates three times so far this year. Earlier this week the 10-year Treasury yield hit a seven-year high, pushing the average mortgage rate above 5 percent for the first time since 2011. Trump has long chafed at the Federal Reserve's handling of interest rates, calling the Fed "crazy" on Wednesday and said it is "going loco." During a phone interview on the Fox News channel, Trump said the market had dropped because of the Fed and the Treasury. "The Fed is going wild. I mean, I don't know what their problem is that they are raising interest rates and it's ridiculous," Trump said. However, market observers say part of the reason for investor skittishness is Trump's protectionist policies and the seeming impasse between Washington and Beijing over tariffs as the world's two largest economies continue a monthslong battle over trade. The International Monetary Fund warned on Tuesday that the global economy would suffer if the trade standoff was not resolved. China has already had to pump billions of dollars into its own economy to brace against the impact of Trump's tariffs, and U.S. companies are contending with the financial impact of retaliatory tariffs. Ford announced last week that it was taking a billion-dollar hit due to tariffs and Walmart has warned that it would have to raise prices for many of its China-made products. National Economic Council Director Larry Kudlow dismissed the market turmoil, telling CNBC on Thursday that America is "crushing it" and "doing better than anyone could dream of," noting that one of the ultimate goals for the Trump administration was to be able to eliminate tariffs and subsidies altogether and proceed with fair trade.